If you're anything like me, the thought of a writing conference is both exhilarating and terrifying. I love to learn from the experts, so a weekend with authors, agents and editors is ideal. However, having to talk to said authors, agents and editors is fairly intimidating for an introvert, considering I'd rather be reading at home on a Friday night than, you know, interacting with people. 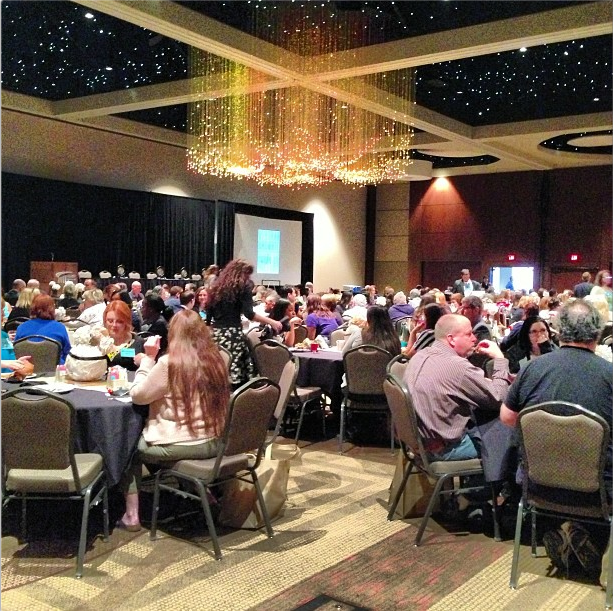 Still, a writing conference is a great opportunity, so I put my fears (and social awkwardness) aside for one weekend to attend the DFW Writers' Conference in June. It was a great experience, and I learned a whole lot about writing. I also learned what to do (and what not to do) next time. If you're an introvert like me, check out the tips below for ways to stay sane in an environment that might otherwise be incredibly overwhelming. 1. Attend icebreaker sessions. If you're like me, the thought of attending an icebreaker session is somewhat akin to the threat of water boarding. However, it's a great way to meet a few people that will become friendly faces throughout the conference. Who knows, you might meet someone from your town or exchange email addresses with a potential critique partner. It also sets the tone for a weekend of getting out of your shell just a bit to really experience what the conference has to offer. 2. Sit at empty tables. Too intimidated to approach a table full of people, especially when they're already in the middle of a conversation? I feel your pain. Choose the less daunting option of sitting at a table with only a few people. Chances are, the other people are introverts just like you and will be relieved to have a new friend. Or, pick a completely empty table to catch up on your conference schedule. You likely won't be alone for long. 3. Ask people what they write. The great thing about a writing conference is that there is already a common interest inherent to all attendees... writing! It's a built-in conversation starter, and a great way to get people talking. Likewise, know your answer to this question before you arrive, because you'll get it over and over again. It also helps to have a few comparable titles in your back pocket to help explain your interests. 4. Use social media. Social media is a great way to connect with other conference attendees. If you're on Twitter, follow the authors, editors, agents and other writers. Tweet tips from the conference, share photos on Facebook and interact with other attendees without the intimidation of face to face conversation. Also, make sure your social media icons are actual photos (not your cat), so your fellow attendees can recognize who they've been tweeting with in real life. 5. Take a break. Everyone needs a break, but especially introverts. No panels catching your eye? Take that time to grab a coffee and read, catch up on emails or just relax. No one wins a prize for attending the most events and panels at a conference, and you'll be much more open to learning and meeting new people once you've a little time to recharge. 6. Bring a sweater. This is less introvert-related and more comfort related. If you're always cold like me, bring a sweater. Conference rooms are notorious for being air conditioned to an extreme degree, and you'll have a much easier time listening if your body isn't fighting off the first stages of hypothermia. Any other tips for introverts at writing conferences? I need all the help I can get sometimes. And on a somewhat related note, a guide to the care and keeping of introverts from Fast Company, via A Cup of Jo. I'm tempted to post this on my office door as an instruction manual.